Even though many people are aware of it, it has never been really acknowledged that the notation of music has gone through a much more dramatic evolution than other written sign languages since the introduction of machines and later computers. The personal computer and text programs opened up countless new possibilities for correction, copying, editing, but the basic input basically remained the same, via a keyboard and looking at the written text on a screen instead of on paper. Even though there are very good speech-to-text programs pörofessional writers rarely use them, as typing can be considerably faster and more convenient than correcting converted speech texts. Music notation was never revolutionized by a typewriter (even though musical typewriters do exist), and for a while the most revolutionary idea was Stravinsky’s invention of a stave drawing device. When the first notation programs for personal computers began to appear, they were usually cumbersome, inconvenient or programmed by people with no clue about music (like the early versions of Finale). But very slowly they catched on – I would define the moment they became attractive for composers was when it became easy to hook up a midi keyboard and actually press the key of the note to be notated. In early notation programs one had to physically type the names of notes on a keyboard, now long strings of notes and especially chords could be inputted very quickly simply by playing them. Soon it also became possible to input music by actually playing it with a metronome (or a flexible metronome, like in Sibelius) and have the notation program do the dirty work, but right now this input method is still as slow as dictating, as the amount of mistakes to be corrected is counteractive to the speed gained in inputting. Still, most amateurs I talk to think that exactly this is the way music is notated with a composer. Very often I have to explain to them that I mostly don’t compose WITH the computer, but INTO the computer. The former is only the case when one creates electronic music or uses composition algorithms. If one is proficient at programs like Sibelius or Finale it is already very easy to do conventional notation, probably up to 90% quicker than writing it by hand. If one uses a lot of complex or experimental notation it is very different, though, and complex scores still take longer to input than doing it by hand (but then have the advantage of playback and part extraction). I come from a generation which started out writing everything by hand, and I can definitely say that notation software has vastly magnified my output (for good or worse). I remember that I used to spend whole weeks with doing nothing but copying parts or copying score sketches into a clean score, work that was completely uncreative and didn’t make me a better composer and was very time consuming. Now these things can be done in the space of a few clicks, which really is a dramatic change, as I can concentrate much more on the creative process. The most dramatic change is the playback feature, though, which on one side is very practical if you have to demo your work or give choreographers or singers an impression of the orchestration, but which can also delude and misguide composers who now spend a lot of time correcting or even inventing their music by constantly playing it back instead of listening to it in their head (which is much, much quicker). I very often force myself to work away from the computer for first sketches, because then I will not be distracted by this temptation, once you have a firm grasp of what you want to write, the playback is actually only needed at the end for checking things. But for composers it has changed a lot in the way they work – imagine you are a playwright, and while you write a play there is a simulation of actors actually playing it on a stage! A composer can do exactly that with an orchestra piece, and right now the playback possibilities have reached a stage where most amateurs can be fooled by „artificial“ orchestras. Still, I know many colleagues who are so used to writing music by hand that they don’t want to directly input it in the computer. They usually prepare either extensive particells or fully-blown scores, and then set out to copy them into the computer (or have other people copy them, like Wolfgang Rihm or Jörg Widmann). I agree with the notion that for pure liberty a pen with a sketch pad with some staves on it can’t be beaten. Even though I usually write my scores directly into Sibelius, I usually do quick written sketches first, sometimes in a coded shorthand that I can only understand a couple of hours after writing it myself. Often have I looked at old sketches of mine and understood….nothing. My shorthand code constantly changes, and I sketch very quickly and messily, but then it is fun for me to input it into Sibelius and make it clearer. For these composers and perhaps also me there is another revolution at hand, in the form of this new program called StaffPad:. With this program you can write on a pad, and the computer turns everything you write into neat notation immediately, while at the same time giving all the possibilities that other music notation software gives: copying, transposing, playback. So for the first time you can sketch something and make it „real“ immediately. Actually there were already a couple of simple handwriting notation programs, mostly simple affairs for the ipad. But StaffPad has been optimized for Windows 8 and Windows Tablets, apparently a conscious decision because the interface possibilities are better than on a mac or ipad, and features things that have not been seen. I am not endorsing this program – I have no idea how it is, and I don’t plan to acquire a Windows Tablet anytime soon. I also feel that I would actually be slower when using a handwriting interface, as a keyboard combined with a keypad can be much faster for input than writing can ever be. But looking at the demo some of the features of StaffPad look already very impressive, and it might be a great tool for composing while travelling, when your studio setup is not available. We will see. Another (minor) revolution might just be around the corner. Nächster Beitrag Der Schatten des Zensors. In a way there *are* ways of notating music that compare to the invention of the typewriter: notation tools that process text input. In these you type in what you *mean*, and the computer turns that into a visual score. The problem with music notation technology other than writing by hand, for composers, is that all barriers which have to be overcome help to intensify the mental focus upon the music proper. Notation technology is helpful for publishers, but where it enters the composer’s territory, it compensates for lack of talent. It gives a gloss to mediocre or bad music, like an attractive bottle which is actually holding inferior wine or no wine at all. In the same way, writing poetry or literature, the ‚cumbersome‘ method of writing by hand has a specific influence upon the mind. If Proust had had a computer, he would never have written ‚A la recherche du temps perdu‘ in Word, looking at a softly buzzing screen. If Stravinsky had written his scores on an Ipod, the music would not have had that tactile, colourful quality: he wrote his scores in the way a visual artist would draw or paint, in colours and shapes, in direct contact with physical properties. A screen can never reproduce all of that. The mind is not merely an utility machine, and IT can never match the qualities of the creative process. The logical conclusion from Johns post is: Make composition even harder, don’t use any paper, do everything in your head. Which can be rewarding – probably – but alas, also frustrating. Hey, I actually compose because it’s fun doing, and not because it’s a chore that I suffer for the greater good of „Holy“ Art Music. Most of the time I am still frustrated at how bad notation programs are, compared to word processors. The main reason for that is, I believe, that the language of musical notation has evolved over centuries since the medieval time, and what was useful at a time, is not necessarily useful now. We seem to be stuck with a strange mix of pseudo-italian score-language and notation symbols of music that worked completely different than what we write today. @John Borstlap: So when Improvised Music is written down later (without changes), it is more „intense“ than before? @Stefan Hetzel: Reflection offers time to think / rethink…. Writing-down improvisations without any change means either the impro was excellent (which it rarely is) or the composer is not so critical. The cadenza’s in Beethoven’s 3rd and 4th pf concerto are obviously the product of improvisation, but in that time improvising had developed onto a very high level. Also, in that time, the general musical language lent itself very well to improvisation. It is not the process of writing-down itself but the ‚enforced‘ time and mental focus it provides. The urge to get things more ‚easily‘ done or ‚quicker‘ is the opposite of what composing as an art form requires, it seems to me, and that is not something unusual but merely common sense. @John Borstlap: Thanks for clarification. The problem is that a lot of forms of contemporary improvisation don’t lean themselves very well to being written down – but are they therefore bad music? Well, the reason of this seems obvious: Münch „comes from“ European art music, while Thomas „comes from“ jazz. In my opinion, the way Münch improvises is deeply influenced by using staff notation all the time, while Thomas‘ style doesn’t seem to care about this. The question is: Has this something to do with the artistic quality of their output? @Stefan Hetzel: I could not possibly listen-out these two improvisations, and found them amorph and self-indulgent, like someone who has heard a Debussy prelude for the first time and thinks: oh, I can do that too. As music, not very interesting, as improvisation, nice, but probably nicer for the players than for listeners – in case they would want to spend their time on something holding their musical interest for longer than a couple of minutes. Unless one is a Bach, Mozart or Beethoven, and fully schooled in a musical language which provides means of structure, narrative, contrast, momentum etc. etc., to create really interesting music one has to invest time for reflection, working-out, rethinking, etc. etc. and no IT gadget would be capable to compensate for all of that. For that reason, jazz is great for improvisation but very restricted in terms of narrative, structure etc. and thus, also in terms of expression. Sometimes, as a composer, I have to be quick. A melody just pops in my head, and it is good, but only if I can write it down fast enough. It is literally a battle against time, because I forget it very fast. I do scrupulously rethink the things that came out from such a fast improvisation-like sketch. But often enough, I have found that the original idea was already the best, and the only work I have to do afterward is polishing (ie, finding the right way to notate it, instrumentate it, etc.). On the other side it seems a bit unlikely to me that an artist who died several hundred years ago (Beethoven) might be a great inspiration when trying to solve 21st century’s aesthetic problems – apart from the undeniable fact that there’s a lot of timeless value in any great art in the sense of, say, „all philosophy is only a footnote to Plato“. But isn’t it also an undeniable fact that Plato didn’t have to deal with the Large Hadron Collider (and Beetoven with Super Collider)? Aesthetic judgements like this just make no sense to me – not because Vermeer and Pollock are „incompatible“, but because you can only compare their respective aesthetic achievements when taking their contingent historic circumstances into account (you wouldn’t accuse Vermeer for not dripping, wouldn’t you?). @Stefan Hetzel: All very reasonable points… but don’t we also take into account what an artist wanted with his work? It seems unreasonable to criticize Pollock for not pursuing perspective, narrative, realism, etc. etc. and to restrict himself to pattern making, but if we look what is possible with something like a painting, as so many older painters have shown, than we cannot escape the conclusion that what Pollock wanted, is very poor in terms of visual information. Do we expect so little from a painting? What does it say about the historic context within which a Pollock painting was celebrated as ‚the expression of the times‘? The same with music: Reich is great, yes, if you forget what is possible with a mere 7+ notes as Herr von Beethoven showed, – if these contemporary artists are respected and celebrated for what they achieved, how poor our times are. Surely there are many other artists than Pollock and Reich, but what other artists do is being measured by what some general, collective consensus has decided to be a standard: being modern, being contemporary, being of its time, being progressive, etc. etc. and all these considerations are not artistic ones. Behind these thoughts lies a tradition of progressiveness, stemming from the 19th century (‚Kinder, macht neues!‘) which has gone completely out of hand in public space. Works of art CAN be compared outside their historic context. We can train our eyes and ears for artistic qualities by seeing and hearing. What we learn, should not be thrown overboard when confronted with a work of art that seems to want to avoid the things that make art interesting and engaging. That is why we can decide that the cave paintings of Lascaux are really remarkable because of being so old, and have artistic merit, especially in the context of their time, but are also rather poor in comparison with what had become possible much later when many more possibilities became available. It is not a matter of new or old, but of available possibilities and what can be done with them. That’s why John Cage is a silly hippy, Xenakis a flipped engineer, Boulez a pretentious sound artist, and Philip Glass a simpleton with vulgar ideas. We can hear that because we can compare, and if our times cannot produce great art – which I doubt – we should try better. But that is easily said, and very difficult to bring-off, since it is not expected in public space. The music from Pierre Boulez is both more aesthetically pleasing and more interesting to me than anything by Beethoven, sorry. Just bashing music you don’t like (just as I did with Beethoven here) is not a valid form of music criticism. I was not born liking atonal music. But even as a child I had the potential to look out for something that’s different from the music I grew up with. When I first heard Ustvolskayas music, I hated it. Now, I consider it among the finest art music I know, and I also enjoy it. This is why dismissing something you don’t like never works out really, because that may just be based on plain ignorance. Knopfspiel merely says that classical music is nothing for him/her, fine. 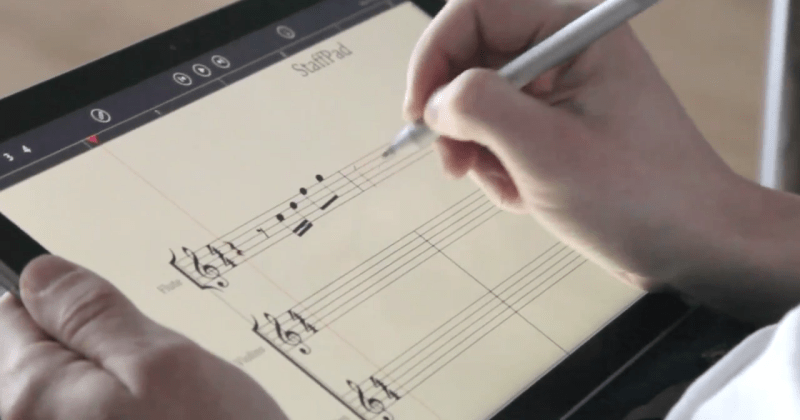 If he/she were a composer, the new music notation tablet is just the right tool. What gives you the right to claim it’s not music? Or even where to draw the line? Even if I bought into your odd distinction between music and sound art, then Boulez’s works would still be firmly on the music side. On the other hand, even Mahlers work was „noise“ to some people of his time. It’s always quite difficult to answer such wild reactions…. where to begin? And what’s the point? But, for information’s sake, I will give it a try: 1) I offered an opinion and argued it, so notions like ‚claim‘ and ‚right‘ are irrelevant. Where all possible sounds, especially unrelated sounds, can be music, nothing is music, so it seems merely common sense to draw a line between art forms where sounds/notes are structurally interrelated and art forms where there is not such interrelatedness. This would put Boulez firmly in the sonic territory (actually, his sonic art is quite nice and aestheticaly pleasing). 2) That people found Mahler’s work ‚mere noise‘ in his time, is no argument: we don’t know those people, their musical experiences, their background etc. etc. and there were also lots of people who thought his work was great. Mahler was regularly performed in the 1st half of the last century, before his work took-off in the sixties with the then new stereo recordings. 3) If a discussion relates to Western / European music, arguing from an European point of view is OK. In Europe, art music / classical music is European, and there is nothing wrong with this as there is nothing wrong to maintain that Indian classical music belongs to India (would it be narrow-minded to state that Indian classical music is part of Indian culture?) 4) Aboriginal folklore is, like Congo drumming, Peruvian music for mouth harp, etc. etc. part of the local folklore culture and there is nothing wrong with stating this fact. Also it is not wrong to suggest that European classical music (so, not sound art) has more aesthetic / artistic interest to offer than many folklore traditions. Don’t forget that simple Russian folk tunes got ‚upgraded‘ when treated by Stravinsky, Bartok, etc. etc. and became part of art music. What could be ’narrow‘ by such observations? Instead, it would reflect some knowledge about culture if such simple distinctions can be made. It is the restricted and uninformed thinking as shown by the former comment that welcomes such gadgets like the music notation tablet… because it gives the impression that other difficult things are no longer necessary. Knopfspiel – as I see it – has an **inclusive** perspective on the „aural world“, because he wants to be inspired by as many sources as possible (and, of course, he doesn’t want to discriminate anyone or anything). John – to me – looks for a socioculturally authoritative musical value system that should be as **exclusive** as possible, because he wants to make his value system as strict and unassailable as possible. I agree with knopfspiel in embracing the diversity of the aural. But I also agree with John: There is a necessity of a socioculturally authoritative musical value system. But what (who) is included here, and who is excluded? John is very clear here: Nearly anything normally called „Neue Musik“ should be excluded. But, John, how to compose art music then without being immediately identified as a „retrospectivist“ or an epigone of, let’s say, Richard Wagner or Brahms? Do you really think it is possible to deliberately forget the last 100 years of art music’s development? I don’t think so (simply because it’s not possible to deliberately forget anything at all). So you only can actively ignore or dismiss this 100 years (which is the way you’re dealing with the problem, I think). Good luck! @Hetzel: Sorry…. wrong again. I am not excluding anything. I merely confer different values to different things, from the point of view that every work of art has its own context which should be taken into account. Embracing ‚everything‘ while ignoring the manyfold contexts which exists always and everywhere, leads to a neutral brown, as in painting happens when all available colours are indiscriminatingly mixed together. I am totally for pluralism in culture, but against throwing-in everything in one pan, stirring it, and selling it as ‚all-compassing the entire scale of aural experience‘. The ‚Beruehrungsangst‘ for historically-informed modes of composition is a fruit from the last century… It would have been totally incomprehensible to an artist living, say, at the end of the 18th century, when architecture tried to emulate old Greek aesthetics, and Haydn, Mozart and Herr Ludwig integrated baroque elements in their pieces. Or for artists in the Italian Renaissance who tried to be contemporary and modern – and quite consciously so – by imitating the culture of Antiquity. A Renaissance architect tried to forget a couple of hundreds of years to reach back to what to him seemed a golden age, and the drive for achieving something of value in this way resulted in the Italian Renaissance which conquered the world at the time and which nowadays fills the museums with iconic works. The attempt to recreate the old Greek plays resulted in the creation of opera. What if we had the courage to ‚forget‘ deplorable establishment ‚modern music‘ which is no longer very ‚modern‘ – because of aesthetics of half a century old – and tried to pick-up things where they were left-off? That is: the pluralist tonal pre-1940 styles? In fact, quite some composers do try exactly that: David Matthews, Nicolas Bacri, Richard Dubugnon. Not necessarily ‚imitation‘ or ‚pastiche‘. The last century created a form of blindness to the richness of available artistic possibilities…. while in the same time, old art has been given an almost religious status – also not quite right, it seems to me. You and Knopfspiel are Germans, right? I am not. Funny that I seem to defend ‚German values‘ of professionality…. and am criticized for it by Germans, on a German serious music site. That statement may seem extreme, but I think it is true in a way that through analysis, mathematical analysis of a piece, you will always find a pattern. This confuses me greatly, since in Boulez‘ music there is a great deal of interrelatedness. Especially in the later pieces, not the strictly serialistic ones. To say that interrelatedness has to come from a very specific way of arranging sounds (ie, major and minor chords and such) actually narrows down the term „music“ so much that it becomes meaningless for me personally. It seems from your post that you consider Bartók and Stravinsky part of „music“, but Boulez is „sound art“? Where do you draw the line, between Schoenberg and the serialists? Are Ligetis late pieces music again, since they are much more classical than Lontano for example? I am confused why you would want to draw a line here – because it seems like an impossible task. There is always something in between. I’m interested in music, not in labels. It matters not to me if I write something that would be labeled european, or western. It matters to me that it is a good piece of art. Well, we are biased, we grew up in that culture. As your example with Bartók and Stravinsky shows, european music tradition would be far less interesting if it weren’t for outside influence. I don’t know how much our different terminology matters. You have said often enough that you do like what you call sound art. If you want to have your own definition of „music“, then fine, you can have it. But I and many others use a broader term, and when I discuss „music“ I am not talking just about western european classical traditional music, I am talking about all kinds of music. It seems to me, that such categories are of no use to a composer. Almost all great composers in the classical european music were progressive, added something to the musical language of their time. To dismiss those that have still done that in the 20. century seems a little hypocritical to me. I don’t know what you have against a particular notation device. I work mostly at the piano, with pencil and paper. I have said previosly that there sometimes are ideas I would like to notate very fast (my writing speed on paper is just not very fast). Maybe you never experience that, that’s fine. I am not denying context by calling something „music“ or „art“. And I even agree with that. I just don’t agree with your solution to it – well, actually, I don’t know if you have proposed one. How would you evaluate if a piece is good art, then? If you just don’t like it, that is not a good criteria. Is the consensus of experts no longer capable of doing that? Yes, and in my generation this „Berührungsangst“ does not longer exist. We can now take from every style of the past, and recreate stuff. It is the generation before mine that has had a Berührungsangst. I noticed that some of my professors still have it. I personally love neoclassical music. Much of my own music is influenced by that, and sometimes I even feel a little bit like „the conservative guy“ when I am around other composers here. But even I can get really bored, when someone just recreates the same style over and over again. This may be a matter of taste. I certainly value the music from Haydn. But I only enjoy it, when I analyse it, and find all the amusing quirks. If I just listen to the harmonies, I get immediately bored – there are just this many chord progressions you can have in this style, and it doesn’t take long until you have heard them all. I’m too much interested in harmony to be satisfied with that. Like your example of the cave-painters: Our possibilities of writing music have expanded so much, and I’m just not that much into this particular historic era. The notion of ‚progressiveness‘ is too often understood as an extension of artistic means but that is not necessarily so: availability of means in a certain historic situation offers the free choice to accept and to reject because artists make choices all the time. It could be ‚progressive‘ to reject recently developed means because they are inferior. The freedom with which young composers can choose nowadays often stops short at the door of history…. but if there were a real freedom, one could accept or reject anything, be it new or old, for artistic reasons, for quality reasons. The taboo on rejecting recently developed possibilities is nonsensical and, in fact, conformist. Arvo Paert has rejected an awful lot but his music is great, I find. The fact that criticizing a consensus which ‚instructs‘ composers to be ‚of their time‘ immediately provokes accusations of ’narrow-mindedness‘ and ‚restricted vision‘ etc. etc. proves there is still a lot of modernism around, maybe less on a conscious level but certainly unconsciously, given the Pavlov reactions, also on this site. THAT is what is very interesting, because it shows what is going-on under the surface. @knopfspiel: Great comment, thank you :-) I agree: John asks the right questions, but his answers are at least debatable. But that’s OK, because, as creative people, we definitively have to give the answers ourselves. @John: It’s true, I’m German. I don’t quite get why you linked this video, but I like it, from first impression. Maybe also because it’s short. I have enjoyed some Haydn pieces, but really only after analyzing it… it’s not something I enjoy just by listening. But the handwritten scores also provide important information for interpretation. Disappearance of handwriting also lost this information. Beethoven´s music should be naughty, dirty, messy and „ratzig“ played so often, because then it´s true Beethoven. Bach is the opposite: Clean, clear as his autograph. And so his music must be played. Another method to quickly write with hand notation is the old tablature: A shorthand notation (stenography) in letters or numbers for music. But it must be practiced. You can find an example: Wikipedia, Nicolaus Bruhns Manuskript des kleinen Präludiums in e – Moll, Tabulatur.